"Les Femmes savantes" (1672) is not one of Molière's plays encountered very often in English Canada. The Stratford Festival has never done it even though Richard Wilbur has given it a fine translation as "The Learned Ladies". The thinking must be that while everyone is aware of misers, hypocrites and hypochondriacs, it's hard to find an equivalent to the "précieuses" of Molière is satirizing. What is more difficult is that Molière ridicules these women for seeking more knowledge that a woman should have. Director Diana Leblanc has found a neat solution to this problem. She has reset the action in 1912. The learned ladies of the play become ridiculous not so much for seeking knowledge but by adoring a male faux-philosopher Trissotin when they should be campaigning for women's rights and for becoming Platonists when they should be looking for concrete gains. The story could even be set today with Trissotin as a new-age guru. The plot, in fact is very much like a gender-reserved "Tartuffe" where the wife not the husband has fallen for the smooth-talking con man who is selling poetry and philosophy instead of religion. The plot follows a familiar pattern. The practical Henriette has fallen in love with Clitandre, a young man of good family. Henriette's hen-pecked father Chrysale approves of her choice, but her mother Philaminte is set on having her marry Trissotin. One complication is that Clitandre was formerly in love with Henriette's sister, Armande, who then did not return his affection but now feels she has a claim on him. And then there is Chrysale's sister, Bélise, who is convinced Clitandre is in love with her. While changing the period of the action has advantages, relocation the setting from a house in Paris to the deck of an ocean liner has not been thought through. The new setting does add a sense of adventure (similarly Tom Stoppard moved Molnár's "The Play's the Thing" from a castle to a ship in his adaptation "Rough Crossing"), but, unlike the time change, it is difficult to see how it benefits the play. How is it all these friends and relations happen to be on board the same ship? Where are they coming from or going to? How can characters receive letters on board instead of telegrams? Besides that, designer Glen Charles Landry has painted "L'Île de France" on a prominent life preserver although that ship was not built until 1927. He probably means the "France" built in 1912. While the first two acts play very well in an outdoor setting like a ship's deck, but the last three must be indoors. Although we are probably meant to see that last three acts as taking place in Philaminte's cabin or the ship's library, in this production it looks rather as if Philaminte has asked for her indoor furniture to be placed outdoors since the life preserver hasn't been removed. Sarah Balleux has designed colourfully whimsical versions of ladies fashions of the Teens. Most of the cast give fine performances. Among the women France Gauthier is deliciously funny as Bélise, a woman who is convinced that all men are in love with her. Gauthier knows that the best way to make such a character work is to play her as completely serious the better to bring out her quiet lunacy. 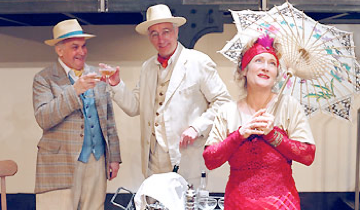 Among the men TfT Artistic Director Guy Mignault with his perfect comic timing creates a hilarious portrait of Chrysale, the easily cowed milquetoast. Robert Godin is a genial Ariste and François Grisé is an attractive Clitandre, able to make the ardent lover's sincerity natural and believable. Jessica Heafey shows that Armande's pain at Clitandre's rejection is never far from the surface and is clearly the reason she has joined the "learned ladies". Heafey's fine performance wins Armande our sympathy and gives the comedy its depth. Martin Randez provides quite a different take on Trissotin. Rather than the usual effete pseudo-intellectual, this Trissotin is a buffed hunk who delivers his verses as action poetry. As with the 1912 setting, this casting helps shift Molière's satire away from women's learning to lust disguised as learning. Randez fills the bill although he looks rather more as if he dropped in from the 1970s. Mélanie Beauchamp wins waves of laughter for playing Martine as a gruff French-Canadian servant who frequently misunderstands what others say. Colombe Demers is an oddly sullen Henriette without the pluckiness or poise one expects in a Molière heroine. She seems to be in such a bad mood throughout the show even when Henriette is with her beloved Clitandre, one thinks he perhaps should have stayed with Armande. Louise Nolan catches the general looniness of Philaminte, but compared with Gauthier and Heafey, she is rather too overtly histrionic. Sébastien Bertrand as the scholar Vadius who knows Greek seems to shout all his lines. It would not take much to make this production more successful especially since Leblanc has solved the major problems in making the play work today. Her direction of the scenes between Bélise and Clitandre, Ariste and Chrysale and of the poetry reading of Act 3 is rich in comic detail. Anyone who wants to fill out their knowledge of Molière should not hesitate. Photo: Robert Godin, Guy Mignault and France Gauthier. ©2003 TfT.